Gov. Michael J. Dunleavy today rolled out his three constitutional amendments that’d put any and all changes to the PFD, taxes and state spending ultimately in the hands the voters. At his roll out, he pointed to Colorado’s Taxpayer Bill of Rights as evidence that putting financial decisions to voters will be a boon to the economy. “For example, Colorado has the Taxpayer’s Bill of Rights. They have one of hottest economies in the country right now because there are industries moving there that feel like they won’t have a predatory tax put on them,” he said. The governor’s not wrong about the current state of Colorado’s economy. Headlines about the state’s high economic growth dominated in 2018, and the state lagged only behind Washington (which Dunleavy also plugged as an example of where restrictive spending limits worked) when it came to its annual GDP. The 2018 boom happened to come 26 years after Colorado implemented the Taxpayer’s Bill of Rights, which sent shockwaves that the state is still recovering from. Even though the state expects to return some of its revenue to local governments, temporarily reducing the income tax or by offering a sales tax refund, the state had to go to voters for bond projects to fix the state’s roads (both failed on the 2018 ballot). But we’re not here today to review the long-term economic impacts of the Colorado’s Taxpayer’s Bill of Rights (TABOR) and what similar measures would mean for Alaska’s economy. Instead, let’s look at how Colorado legislators have grappled with the TABOR requirements. In the nearly three decades that the laws have been in place, Colorado’s lawmakers have found ways to skirt the requirements by ratcheting up fees, literally mortgaging state buildings or other budget tricks. Can’t raise taxes without a public vote? Charge a fee, instead. Want to plug a hole in the transportation budget? Borrow against the equity of government buildings. These workarounds are legal — many have been explicitly authorized by state courts. But they have wide-ranging consequences for Coloradans. In the TABOR era, state tax rates have gone down, but fees have increased, shifting a higher share of the cost of public services to low- and middle-income residents. According to the report, that’s lead to higher fees for parks, roads, university tuition and patient surcharges at public hospitals. The portion of Colorado’s public universities funded by students has grown to 64 percent according to the report. On top of the existing vehicle registration fees, the state also charges surcharges for road safety and bridge safety ($23 and $18 for an average-sized vehicle, respectively). At the 25-year anniversary for TABOR, Colorado ranked third in the portion of its revenue that came from fees and services. That number has dropped since then to 11th with 14 percent of its income coming from fees while Alaska currently sits near the bottom of the list. The possibility of shifting costs from the state’s dwindling tax revenue to fees has already been floated this session. At a Jan. 23 Senate Finance Committee meeting, Office of Management and Budget Director Donna Arduin confirmed the administration will not be considering any new forms of statutory revenue but said increased fees could be on the table. But details of such potential changes weren’t shared with the Senate. For now, the Legislature—and the rest of Alaska—will have to wait until the final day the governor can submit his budget. “Our proposals and specifics will be available on Feb. 13,” she said. 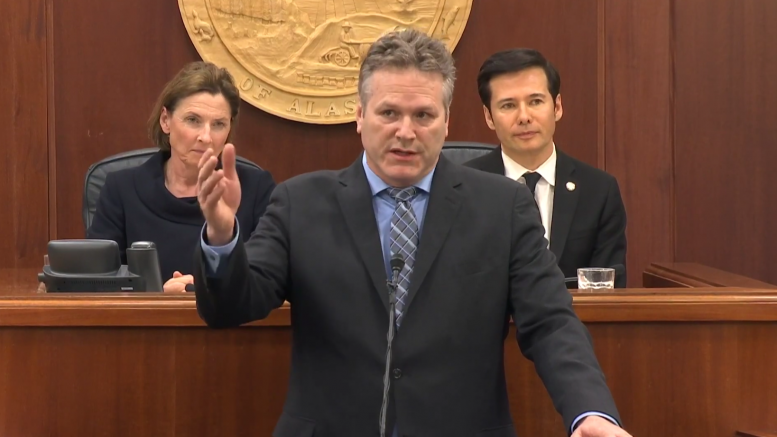 Be the first to comment on "Dunleavy’s constitutional amendments could push higher fees onto Alaskans in the long term"